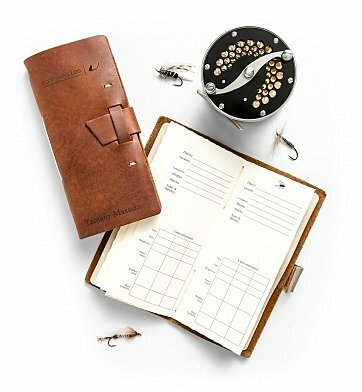 Now your favorite fly fisherman can recall and write down all the details of fly fishing adventures with this sophisticated offering. Crafted from top grain cow hide, this durable and portable journal features space to record the date, location, companions, weather, hatches, catch information such as pattern and rod used, and space for notes and sketches. One Rustico Leather Fly Fishing Journal, 96 Pages. Your gift is securely wrapped to safeguard the shipping process and arrives presentation-ready with a hand-tied satin ribbon. A complimentary card with your personal message is included with your gift. Free Embossing! One line with up to 15 characters can be embossed on the Fly Fishing Log cover. Enter information to be embossed during the checkout phase of the ordering process. Embossed Fly Fishing Log is a hand delivered gift. These gifts are delivered by one of our local design centers located throughout the United States and Canada. Same day delivery is available for most gifts when ordered before the cutoff time. The cutoff time for Embossed Fly Fishing Log is in the recipient's time zone.